Somethings in life are always beautiful. I had my Ranger Melt Pot out last week, aka: The Cauldron., and made a few pretties with it but … well, one thing turned to another and a little memory crept into my mind of a card I remembered seeing about four or five years ago. Once the memory had taken shape inside my mind (in other words, I remembered enough to give it a good old bash) I thought I’d have try at making the beautiful leaf I remembered. I was quite pleased with how it turned out. It went from a brighter summer green, into a deep, rich, dark green, which then changed into rust and orange, which in turn changed into that fabulous autumn yellow. I took LOADS of photographs of the leaf … and couldn’t for the life of me, get it to show the ultra thick embossing which I’d toiled over until it was perfection. I wanted to catch the shine on the leaf so that you could see that this was something really pretty. It looked like the most beautiful leaf captured inside glass. [sigh] Sadly, I failed. Nothing I did would catch the shine of what looked like glass. So you’ll have to imagine that it’s there. The sentiment – is partly something I read a while back, but I changed it round a little, added a line and changed a few words, and so made it more what I wanted the card to say. Whispering winds which scatter leaves at the end of Summer; A gentle stroll on an Autumn Day; The chill in the air on a Winters morning; The chirrup of bird song which Spring brings. Somethings in life are always beautiful. 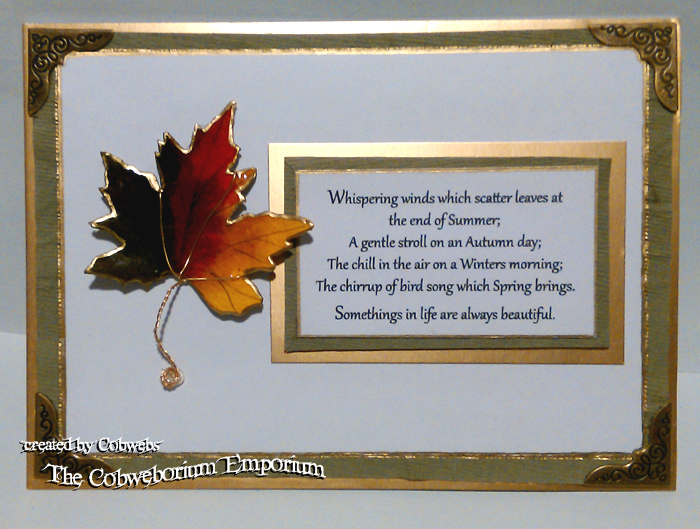 I really enjoyed putting this card together and love the leaf. In fact I loved making it so much that I think I’m going to make it again, only next time a little different. If it works, I’ll share it with you. If it doesn’t … you may never hear another word about it. But .. I might share it if it fails miserably – just so that you and I can have a laugh. LOL. On the day I made this card, I made some other things too – only this time with my Cauldron (Ranger Melt Pot), and I’ll share those things with you next time. Anyhoo . . . HAPPY MONDAY! Just to get the week off to a grrrrrreat start, I give you a joke in the hope of making your heart smile…. Pass the smile around. Share the joke. Let’s see if we can get the whole world smiling. We could use a little amusement now and again. Have a truly lovely Monday. May today be a good one. Sending you squidges from my corner to yours…. Next Melting Pot Pendants, and a Give-away! This is absolutely beautiful! I have no idea what a Ranger Melt is, but when you wrote the words “The Cauldron”…I sort of get the idea! Wonderful post as always! … The Cauldron sums up how blazingly hot it gets, and that little miracles can be made from it, and I’m certain that the very minute skill I have makes these mircles happen. I’ve got to load the photos, but once done I’ll blog them (hoping for Wednesdy), and then you’ll see what I mean. Thank you for the explanation, Cobs! I’ll be looking forward to those photos! Maybe I am just a “visual learner”!!! So fabulous to see you too! Have a fun day!!! Not quite morning here, it’s nearly 9 in the evening and I am now going to knit a few more rows on this last sock, just turned the heel and now it is clear sailing until finished. 🙂 I am glad to be almost done, then I can start on more and different things. I love knitting socks tho’. You have an excellent Monday! Aw those socks sound lovely. Kniting anything but a scarf is outside my capabilities, so I’m in awe of anyone who can make anything where the knitting goes round a corner. Well done you clever thing! Thilled you like the leaf. Wishing you a wonderful Monday too, my friend. Make it a good one! Hello Samantha. How fabulous to see you! Thank you so much for your lovely comment. Bless your heart. A Happy Monday to you too. It has been. Topped off with a little bowl of mint ice cream. LOLOLOL… what a strange and psychotic … or is it psychic? bond we have. Your TV and me, that is. LOLOL. Aw, thank you my fabulous blogging friend. You just haveto be really careful about using it because it get Volcano Erupting HOT, HOT, HOT! But it’s very compulsive. Once you begin you don’t want to stop. LOL … you can get the ‘look’ with your heat gun and UTEE (Ultra thick embossing crystals). You just have to do it in layers. Roughly 3 layers would probably be enough, but you can do more if you feel you need or want to. YAY!! Already an expert then! Thrilled you like the card! Thank you so much for coming Ruthie. Aw, Ruthie, you’re so lovely. I’ve a feeling that The Lord had a bit of a chuckle at me! lol. The pot gets REALLY hot Beverly. And it can be quite heavy(ish) if you’ve got a lot of crystals melting in it. So bear that in mind if you’re thinking of purchasing one. They’re a lot of fun though, and very addictive. You’ll make the thing you have in your mind to make, then you’ll want to make more, and some more, and something else and then something different. And on and on. Thanks for coming and for sharing a coffee time with me. I love your company. I did look into it and google said it has been discontinued.??? Probably the same reason a jar of peanut butter says …this contains peanuts. Us dumbed down people probably couldn’t handle the extreme heat. LOL I may have to just settle for embossing powder. It’s cold again. Yellow flowers are gone but there were 7 turkeys in the pasture this afternoon. Big ones too. NO! Aw noooooooooo. Oh sad. Ohhh I cannot believe that they’d ever discontinue this wonderful little tool of magic and fun. That’s the second of the fabulous toys (tools) in my crafting armoury which has been discontinued this year! The first one I found out abou was the Quilting Machine from Simplicity, and now this one. Well what a bloomin’ shame. Well I’m off to buy more crystals while I still can! On the weather subject: It’s a bit fresh (cool) here, but I have to say that it look lik a nice(ish) day out there. It’s only 11am, so plenty of time for things to happen – especially so since this is Great Britain, land where you can experience all the various weathers, and sometimes all in the same day! Yesterday was really beautiful. An early spring morning which gave me such joy! Had I been able, I felt like I could have gone skipping and gambolling around the fields much like a spring lamb would do! Ha! the mental image alone is giving me chuckles. LOL. Wishing you a truly wonderful Tuesday. Did you do the happy dance? I hope so! Twice. The leaf looks properly amazing. I love the blend of colours to represent the seasons. A little work of art. I do it inside my mind now. Last time I did it I caught sight of myself in the mirror and was so shocked I stopped instantly. Problem was …. my body parts continued moving for another 2 minutes. In fact, I do believe that there is still a ripple going on in the chest area, but I fold my arms to try and get it under control. Next post is something entirely different and .. [whispers] … there’s a give-away of something, and it’s a free choice of a few things! squeeeeeee! (post should be on Wednesday). Wahoo! I will look forward to it. Just do the dance when nobody is watching. Pull the curtains if it makes you feel better…. I have to keep the curtains closed all the time after the accident when I forgot I’d taken the bedroom curtains down to wash and … well the rest is history. Well, I’ve just found out that they Melting Pots have now been discontinued. Dear Beverly of More Ink Please looked into them as she’d not heard of them before, and told me this morning that she found out that they’ve discontinued them. I’ve just been and had a look and they have indeed stopped making the melt pot, apparently due to a drop in demand, and high minimum order quantity. Terrible shame. This fabulous bit of equipment is a real joy and I’m so sad that it’s no longer there for new crafters, or crafters who fancy a bit of something different, to have a play with. Going to have to keep our eyes open when going to the second hand store. how beautiful-and i so love the verse too!! well done! Ohhh, thank you Rabbit. How kind of you.